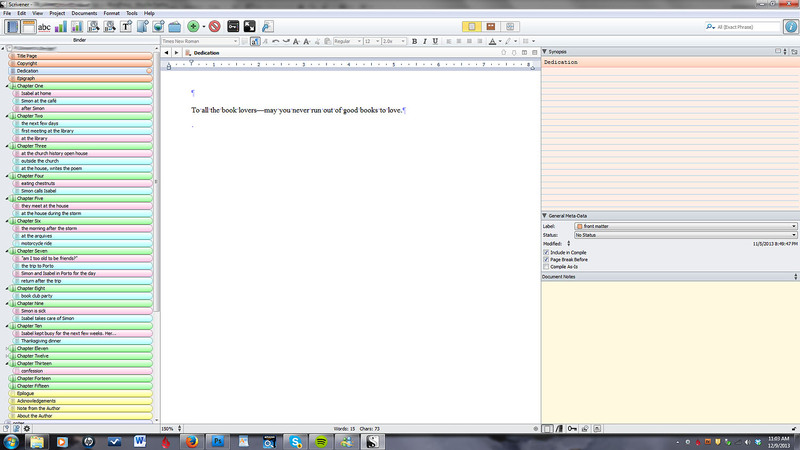 Or I should say, Why I Love Scrivener So Much. 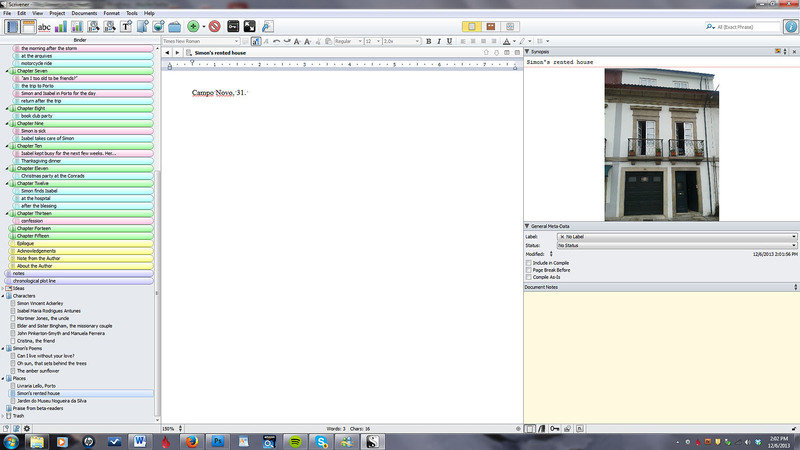 I discovered Scrivener last year, after completing NaNoWriMo. I knew Word was not working for me, and I needed something that could help me organize my writing and have it all available at one glance without the need to open a dozen Word documents, or have little sticky notes everywhere. I had a coupon for Scrivener, and I tried it (though I must say that the full price is only $40, which is an absolute bargain). After watching a couple of tutorials on Youtube, and spending a few days playing around, I was sold. This was the answer to my questions. I love it so much, I’m on a mission to convert writers everywhere to it. And no, I’m not being paid for this endorsement. Disclaimer— this is just the way I use Scrivener. There isn’t a right way or a wrong way to use it, and other writers will use it in different ways. Another disclaimer— Scrivener was originally developed for Macs, and lots of features are still not available in Windows. And another important disclaimer— I’m using screenshots of my Work In Progress. Keep in mind that it’s a very, very rough draft, and I’m only about 1/3 of the way into it. Take it easy on me. So here’s a compilation of my favorite features in Scrivener (Windows version), in no particular order. If you want to follow along, you can download Scrivener for free. 1— Having everything in one place. As you can see, there are 4 main parts on my Scrivener board: 1. the binder, or chapters and scenes; 2. the main document area; 3. the index or synopsis card area; 4. the document notes area. I will explain the binder area in more detail in a minute. The main document area is where I do the writing. I write by scenes, and each scene is assigned to a chapter. I don’t use the synopsis cards too much, but I’ll show how they can be used. The document notes area is where I write notes to myself and where I ‘store’ parts of the text I’ve cut. I love this because I can take out parts of text that don’t work but they’ll still be attached to the scene where they came from, which means I can always put them back without the problem of trying to figure out where they go. It’s very convenient, let me tell you. As you can see here, other than the chapters and scenes, I also have folders for general notes, ideas, characters, and places. I can add pictures to any of these to help with descriptions of places and characters. Like I said, everything in one place. Who doesn’t love that? Before I go on to my next favorite feature, I want to show you a view of the corkboard. Like I mentioned, I don’t particularly use the corkboard, even though it looks so pretty. 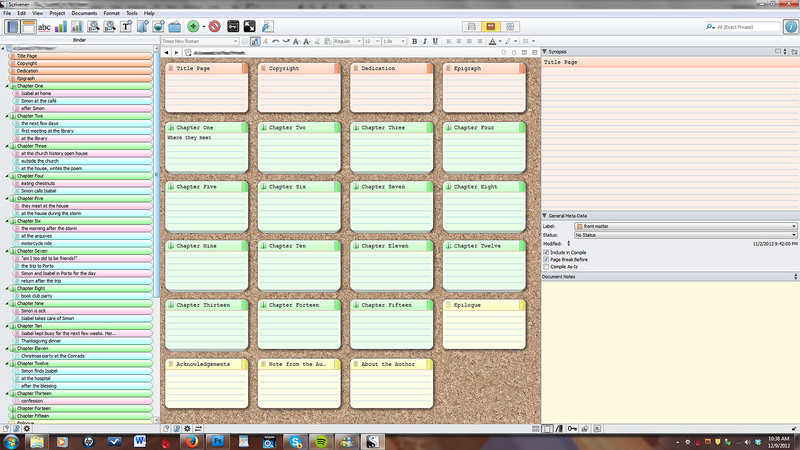 Look at all those colored index cards, just like a real corkboard. If you’re a ‘plotter’ kind of writer and like to put down an outline, this can be especially useful. You can write the synopsis of each chapter on these cards, you can move them around, they can even have pictures instead of descriptions. What’s not to like? 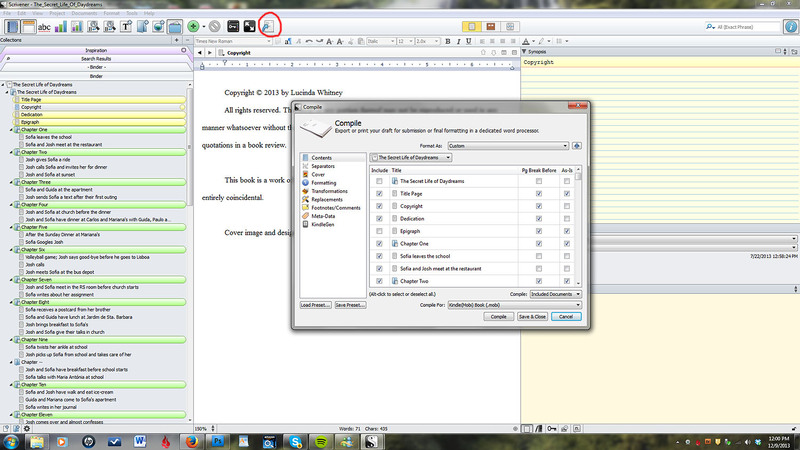 You already had a quick view of the binder, which is the part on the left hand side of the Scrivener project. Think of this as a real, physical 3-ring binder filled with colored page dividers and tabs. You can use any colors you want for these tabs. They are called ‘labels’ in Scrivener. First, go to View at the top bar and scroll down to ‘Use Label Color In’, then put a tick mark on all options (binder, icons, index cards, outliner rows), or only the options you want, it’s up to you. Then go to the General Meta-Data, on the right hand side, and click on labels. You can add/name your labels and choose the colors for those too. For this project I chose a light orange for the front matter (title page, copyright, dedication, epigraph), a light yellow for the back matter (acknowledgements, note from the author, about the author), and a light green for the chapters. For the scenes, since this project is written in 3rd person POV between the two main characters (Simon and Isabel), I chose pink and blue just to differentiate whose POV it is at a glance (thanks, Lindzee A., for the tip!). I didn’t assign colored labels to the notes, characters, places, etc, but you can do that as well. And you already saw how the colored labels also carry to the index cards. Yes, I do love me some color coordination, thanks for noticing! But what I love the most about the binder is the ability to move around the chapters and scenes. As a discovery writer, I sometimes write scenes/chapters out of sequential order. If the inspiration strikes, I write it and I worry later where it goes in the story. As the first draft takes shape, I learn where particular scenes fit and I can rearrange them at my story’s leisure. I give a short descriptive name to each scene so it’s easy to see what it is and where it belongs. If I make a mistake, I can rearrange it. If I decide later during revisions where the final place for it goes, it’s very easy to move it around. So this favorite feature is actually 3-in-1: the binder view (like a real binder), the colored labels (for organization), and the ability to move chapters/scenes. You can find the word counter under the Projects menu. Then click on Project targets and a little box pops up. I set the target word count for this project at 90,000 words, which is based on my first manuscript (I aim for more words during the first draft and then cut out during revisions). You can set any target you want. As you can see, I’m a little over 1/3 of the way. That colored bar starts in red and it moves to green upon completion. The same goes for the daily target count which is the session target. I didn’t write anything today yet, but it’s a thrill to see that bar go from red to orange to green as I get closer to my daily target count. Be aware that if you close your Scrivener project the session target resets itself. I like to keep the project open all day and close it when I turn off my computer. Under the project menu, you will also find a tab for Project Statistics, which gives a quick view of word count for the whole project and for the selection (which is the scene or chapter you’re currently on), and another tab for Text Statistics, which gives you the word and character count for the scene/chapter you’re working on, plus the word frequency by percentage of words used. This can be very useful to see how much you’re using that pet word you love. I marked in red where you can find the tab for this feature, under the main toolbar at the top, and on the lower right hand corner. Say you want to write yourself a little note about a word, or whatever it is, so you can come back to it during revisions. All you have to do is highlight that word or sentence, click on the tab for the comment, and the light yellow bar on the upper right appears for you to write your note. If you go back to the synopsis view, you can hover over the annotated word and the comment pops up. It’s awesome and it saves a lot of time and frustration. I usually save this feature for the quick notes, and use the document notes area for deleted text and brainstorming ideas. Like I said, everything in one place. Another feature I love. For this one, I’m using a screen shot of my first book, which has been edited and revised, sent to beta-readers, edited, edited, and edited, pitched, and sent to a publisher (still waiting to hear from them). When you click the compile tab (which I marked with a red circle), a box pops up. Compiling means exporting your Scrivener project into another format. There are several to choose from, including .pdf, .rtf, .doc, and .html. I use the .doc formatting to turn my Scrivener project into a Word document to sent to beta-readers or to submit to publishers, for instance. But my favorite is the .mobi, which is the format for Kindle books. Along with Kindlegen, which is free from Amazon, you can format your Scrivener project into a Kindle book ready to be published (you can also do the same for .epub formatting). So there is a slight learning curve, but nothing that will take more than a few hours. These are screenshots of the title page (which was done in Photoshop, and it matches the cover), the working Table of Contents, an example of a chapter heading (also done in Photoshop), and the About Me page with live links to my website and social media. It looks really pretty, if I may say so myself. And these are the main reasons why I love Scrivener. This blog post turned out a little longer than I had planned, but hopefully the screenshots are helpful to anyone on the fence about Scrivener. Do yourself a favor and just go get it—it will be one of the best things you’ll do for your writing career. Let me know in the comments if you have any questions, and I’ll try to answer those, or I’ll direct you to the Scrivener Facebook page where they can help you better. 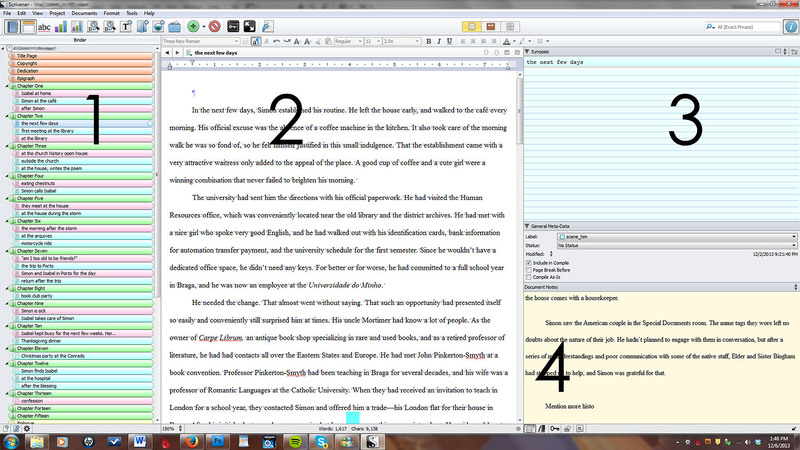 If you use Scrivener, what are you favorite features? You can find more information about Scrivener on my Scrivener pinboard on Pinterest. I agree with you one hundred percent on Scrivener’s best feature ever, Lucinda. Being a, as your put it, “discovery writer” myself, I like to write what I’m inspired to write, then move things around when necessary. Nice confession of yours there about Scrinever. Totally agreed with your words, I for one is a die-hard Scrinever fan. When everything is in one place and organization is at one glance using the binder. The only fun thing to do next is just write. © 2014-2019 Lucinda Whitney Author |ProPhoto Photographer Blogsite | Designed by That's Kinda Cool!